This is our very favorite jam, just like my mom made years ago. The recipe is from the “1972 Ball Blue Book”, modified to current guidelines. In 1972, I didn’t water-bath this jam; I used paraffin to seal the jars. Water-bath processing is a much surer way to save this delicious jam. Check this link for the basics. I do have to buy plums in season; I haven’t found a good source of tart plums like we had when I was a kid. Red Santa Rosa plums are a good choice. I try to make 3 or 4 batches of this jam every summer - it goes fast. Pit and slice plums into 6ths or 8ths, then cut in half. Measure 2 quarts full. Place multiple shallow sauce dishes in freezer to use to check jellying. Sterilize your jars in the water you're heating in your canner. Combine all ingredients in open kettle; bring slowly to boiling, stirring occasionally until sugar dissolves. Cook rapidly almost to jellying point, about 25 - 30 minutes, stirring frequently to prevent sticking - about 215-216 °. If jelly wrinkles when you push it with your finger in your cold dish it is ready. Pour, boiling hot, into hot jars, leaving 1/4" headspace. Wipe rims and adjust prepared lids. Process 7-10 minutes in boiling water bath. Set on clean towels to cool. Equipment: Open kettle, boiling water bath canner with rack, 2 quart measure, large metal spoon for skimming foam, instant read thermometer, large silicone scraper or spoon, jar lifter, lid wand, tongs for jars, funnel, ladle, ruler, pan with paper towels for filling jars, clean towels. Cost August 2009: $4.99 or 63¢ per 8 ounce jar. (plums at 88¢ per pound and sugar at $3.99 per 10 pounds) - an 18 oz jar of the cheapest plum jam was $2.49 at Fareway, 18 ounces of this recipe equals $1.40. Commercial jam contains high fructose corn syrup and corn syrup. I usually buy cane sugar. Do not double batches. Use the large open kettle to cook down rapidly and keep splashing to a minimum. Read directions with your lids to prepare them. I made plum jam last year with a slightly runny texture using low sugar pectin...I MUST try this recipe next time!! Thanks so much for sharing! Yummy! 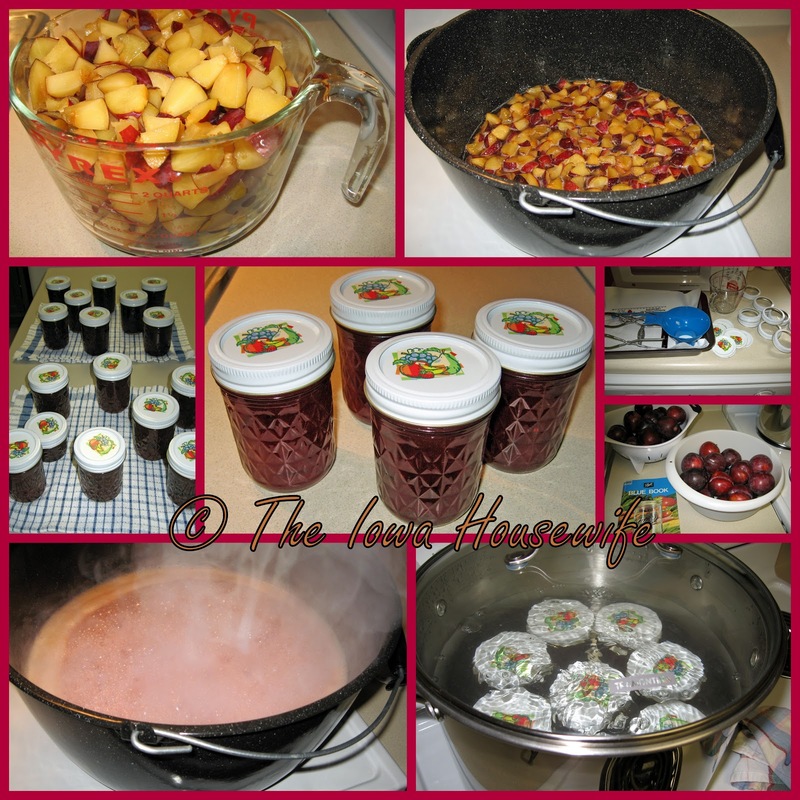 I love canning jams - especially plum! But I figure the cost a little differently (especially if I'm going to sell it - I want to factor in all my costs). I also look at the cost of jars and/or lids, gas/electricity for running the stove so much (and dishwasher if I use it to sterilize jars), water for cooking and water bath canning, and the cost of any pectin or Fruit Fresh in addition to the fruit and sugar expenses. Also, since my plums come from my own tree, I consider the cost of keeping the tree healthy - pruning tools, mulch, organic sprays, organic fertilizer, compost (although compost doesn't cost us anything! LOL), and garden water. When all of that is factored in, the cost per jar (if it's a year where I need to buy all new jars b/c I gave away/sold all mine!) is close to $2. I couldn't agree more on pricing if you are going to sell your product. I do have plenty of jars, I sterilize my jars right in the water bath canner while it is heating to save electricity, I purchased my plums (too bad we don't have room for an orchard), this recipe doesn't require either fruit fresh or pectin so it isn't factored in. We have good electric rates in our location in Iowa, some of the lowest in the country, and our water rates aren't too bad. I don't factor those expenses in for comparison here because they vary so much around the country. I think your comment is very pertinent for those who hope to have a home business. I expect that they also have license or inspection fees as well in most states or cities, and may also need adequate facilities to pass inspection or sell their home-based product...all expenses that must be factored into the price. However, around here, homemade jams sold at the farmer's market or Amish groceries sell for a handsome price...the seller's are factoring in those expenses, as they should.